Serve with crudites and ranch dip- I thought it would be interesting to modify a classic meatloaf to a handheld version AND have my slow cooker do all the work. Tastes just like a cheesy meatloaf; mission accomplished! Place the onion and celery in the bottom of a large slow cooker (an oval-shaped one if you have). In a large bowl, combine the ground beef and the following 7 ingredients (through ground black pepper). Form into 4 patties. Place the patties on top of the onions and celery. In a small bowl, combine the 1/3 cup ketchup and 1 tablespoon of water. Spread the ketchup mixture evenly over the patties. Carefully pour 1/4-1/2 cup water on top of the onions and celery making sure not to pour any on the burgers. Cover and cook on LOW for 5-6 hours or on HIGH 3-4 hours. If adding cheese slices, place one slice on each patties in the last 30 minutes of cook time or until cheese slices have melted. 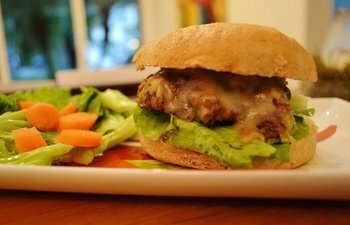 Remove the burgers with a slotted spoon and serve on hamburger rolls with crudities and ranch dip on the side. * You can substitute tomato sauce for the ketchup. In a small bowl combine Greek yogurt and the next 4 ingredients (through black pepper). Serve as a salad dressing (you can thin it out with additional buttermilk) or a spread for sandwiches, dip for wings. Jazz it up with fresh herbs from your garden, add freshly minced garlic for some zip; it has many uses! I like to boil, steam or roast a spaghetti squash and top it with some of the onion and celery from the slow cooker as a nutritious side dish to this burgers. I will usually eliminate the roll altogether and have the patty on top of the squash. For a paleo/primal version, serve patties wrapped in large lettuce leaves. Traditionally mashed potatoes usually accompany meatloaf but try some baked fries; a classic pairing with burgers. A side salad is always an easy and healthy green side in place of the crudities.